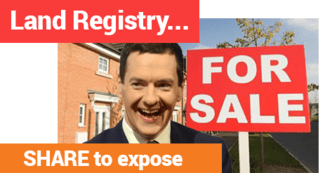 The government’s snuck out plans to sell off the Land Registry – the profitable public service that records the sale of houses and land. It’s a short sighted move to make a quick buck. So 38 Degrees member James, a legal services property expert, is campaigning to stop the sell-off. The government announced the plans just before Easter. Maybe they were hoping to bury the news while everyone was enjoying their bank holiday weekend. A huge petition will shine a spotlight on their plans – it will be our first step in saving the Land Registry. In July 2014 over 100,000 38 Degrees members signed another petition to save the Land Registry – and together we helped push the government to back down. You can find out more about what the Land Registry does here.